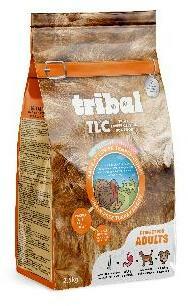 The Tribal range of TLC natural cold pressed dog food has been created using highly 'bioavailable' ingredients. This means that your dog can use and digest as much of our food as possible - resulting in happy, healthy dogs and smaller less stinky poos! You'll never find vegetable protein such as pea or potato protein in our recipes, often used to increase the protein content of foods, as dog's aren't able to digest them as easily and they're just not as nutritious as animal proteins. Tribal use a mixed animal protein source to give your pet a variety of nutrients to keep them happy and healthy. We never use meat meal, grains, wheat, gluten, fillers, pea protein, potato protein, white potato or any other ingredient that has been pre-cooked to high temperatures. Find out more about exactly what goes into our recipes below. 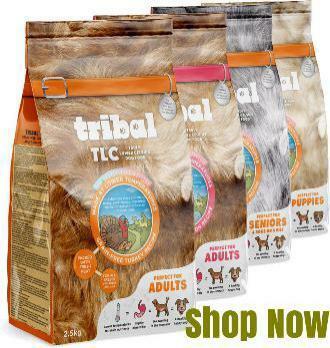 FRESH TURKEY Tribal TLC contains fresh meat as it's first ingredient and is an excellent form of protein, hypoallergenic and highly palatable for dogs. 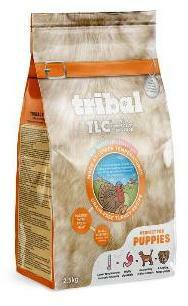 Turkey is less allergenic than chicken and so is suitable for dogs with allergies. Our turkey recipes do not contain any chicken products at all, not even chicken or poultry fat. 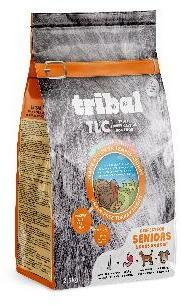 FRESH SALMON Tribal TLC Salmon contains fresh salmon as it's first ingredient and is an excellent form of protein, hypoallergenic and highly palatable for dogs. Our salmon recipe does not contain any meat or poultry products at all, so is suitable for dogs that have meat or poultry allergies. WHOLE FISH HYDROLYSATE Fish hydrolysate is simply fish that has been broken down into smaller protein chunks by water and enzymes, mimicking the digestive action of the stomach and making it much more digestible. This increased digestibility means its also a really great protein source for dogs with allergies or digestive issues. Our whole fish hydrolysate is made in a human grade food facility from whole Blue Whiting, is sustainably sourced just off the coast of Ireland, and is MSC certified. As we only ever use whole Blue Whiting, and never offcuts from various types of fish, we can guarantee that our product is consistent each and every time. WHOLE EGG Eggs are the top dog of all proteins, being even more digestible than fresh meat and fresh fish. They also contain high quality fats, and what's more is they taste great too. SWEET POTATO Packed full of slow release energy, rich in fibre and a great source of vitamins A, C and B6. SALMON OIL High in essential omega-3 and omega-6 fatty acids – great for a healthy skin and coat. GLUCOSAMINE, CHONDROITIN & GREEN LIPPED MUSSEL Our healthy joint blend protects joint cartilage and supports active mobility. Our adult recipes contain a combined 0.2% or 200mg/kg of our joint care blend and our senior/light range contains a whopping 0.4% or 4000mg/kg of combined joint care - containing one of the highest levels of joint care on the market.